PAMS 2013 from Oct. 7 to 11! 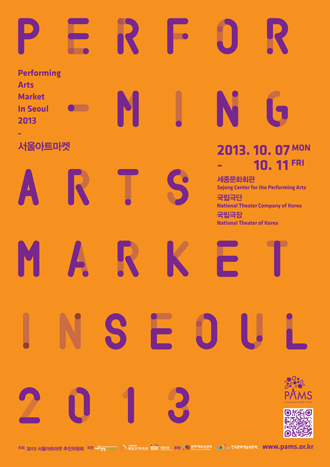 The 9th Performing Arts Market in Seoul (PAMS), a foothold for the advancement of Korea’s performing arts industry, will be held from October 7 (Mon) to 11 (Fri), 2013 at the Sejong Center, the National Theater Company of Korea (NTCK) and the National Theater of Korea (NTOK) in Seoul, Republic of Korea. 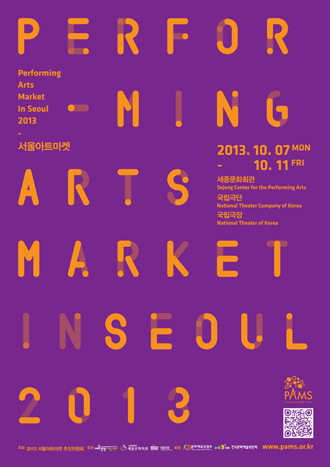 As the first and the only performing arts market of Korea at an international level, PAMS has put its utmost efforts in promoting the Korean performing arts industry with strong growth potential, balancing import and export of productions, and obtaining competitiveness and sustainability of the performing arts field. PAMS has provided domestic and international performing arts professionals - producers, theater and festival programmers, performing arts companies, individual artists, and arts managers - with a platform for international cultural exchange crossing borders. 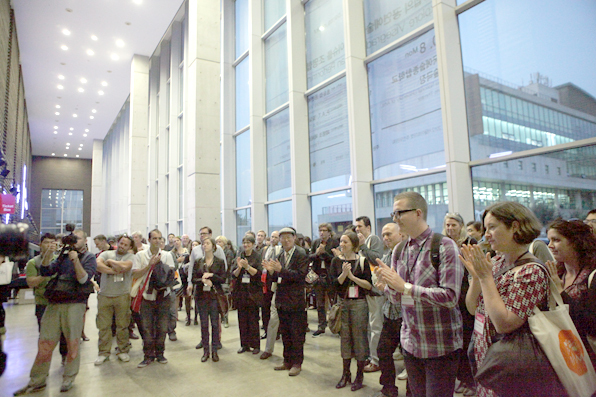 PAMS in 2013 will consist of networking events and diverse programs to share ideas and views, ranging from showcases and conferences to Booth Exhibition, reflecting the contemporary trend of the performing arts field. The 10th Anniversary of the Only International Performing Arts Market of Korea in 2014! The number of international as well as domestic participants has continued to grow for the last 8 years. In particular, the number of the international participants reached up to 223 persons from 53 countries as of 2012, which is more than twice the number in 2006, 111 persons from 29 countries. PAMS Choice has accomplished its fruitful outcome in that the productions showcased at PAMS Choice marked 125 performances done overseas in 2012, comparing to only 14 performances in 2006. It is nearly 10 times of increase only for 6 years. These figures clearly demonstrates that PAMS has internationally become a key networking platform as one of the most renowned performing arts market in Asia, attracting over 1,600 domestic and international participants, while leading the circulation of performing arts works worldwide throughout its history. For the further development of PAMS having its 10th anniversary in 2014 ahead, diverse for will be prepared for the performing arts professionals to exchange their ideas and views on the transformation of PAMS into "the arts market of the future" in the 21st century. The first session of Round Table, titled "Past & Future 10years of PAMS", is particularly designed to catch a glimpse of the future of PAMS through a series of discussions by the professionals in the field of international exchange, festival, market and each genre of performing arts, and companies with experience of international presentations through PAMS, based on the accumulated results of each sector of PAMS for 8 years. Distinguished directors and presenters of major theaters, markets and institutes visit PAMS every year with great expectations on Korean performing arts. This year’s international delegate list including a total of about 200 registered participants boasts the renowned names such as Tony Grybowski, CEO of Australia Council for the Arts, Jarmo Penttila, Artistic Advisor of Théâtre National de Chaillot, Catherine Monlouis Felicite, General Production Manager of Theatre national de l’Odeo, Yang Jingmao, Vice-Present of National Centre for the Performing Arts, Ong Keng Sen Artistic Director of TheatreWorks, and Tisa Ho, Executive Director of Hong Kong Arts Festival etc. The concepts and direction of the 9th Performing Arts Market in Seoul converge into 3 key words, ‘Cross+Contemporary, Continent, Culture : 3CC’ . PAMS will come to be "a festival for networking and exchanging information on performing arts" for 5 days with approximately 1,400 domestic and 200 international participants from France, the UK, the Netherlands, Lebanon, Canada, India, Taiwan, Japan, Malaysia, Indonesia, Colombia, Hong Kong and other countries. International Showcase in cooperation with other performing arts markets and organizations abroad will feature five productions from five countries which are Like an Olive Tree of ’Dance Forum Taipei (Taiwan)’, Strangely Familiar Disasters of ’Thomas Noone Dance (Spain)’, A Malaysian Fusion of ’ASWARA Dance Company, National Dept. for Culture and Arts Cultural Group (Malaysia)’, RefleXction of ’Destins Croises (France)’, and Japanese contemporary performance. These productions will allow an understanding of the new trend, freely crossing and mixing different genres, on the world stage. The academic program, Focus Session will take ’Asia’ as the region of this year with the theme, ’Partnership and Leadership in the Performing Arts Scene of Asia’. All registered participants will be invited to look at a broad range of cooperation models at the various levels including theater, organization for residency, festival, funding organization and so forth in the major Asian markets such as Singapore, Japan and India, and to seek the possibility of future collaboration. LIP (Lookinf for International Partnership) is designed to encourage international collaboration by making an open call for a partner. The performance of Nottle Theatre (Korea) and Tony Yap Company (Australia), one of the leading cases of Korea-Australia Connection (as part of KAMS Connection), is scheduled for LIP Showcase. With an aim at exchanging practical information on performing arts, Booth Exhibition will offer arts companies and organizations a great opportunity to promote their works and look for potential presenters in a place. Around 90 booths will be run by the companies and organizations, attracting Korean and international professionals in the field of performing arts. In addition, the networking events will be held in the form of the programs called ’Speed Dating’, a one to one meeting with prominent Korean and international presenters and producers, and ’PAMS Night’, a mingling event in a casual atmosphere. The networking will be enriched by the participation of the art directors and producers of Doosan Art Center, Seongnam Arts Center, Namsan Arts Center The International Modern Dance Festival (MODAFE), Gwacheon Festival, Festival Bo:m, Jarasum International Jazz Festival, and Ansan International Street Arts Festival, and presenters of Théâtre National de Chaillot, Houtfestival of the Netherlands, Geroge Town Festival of Malaysia and more from 8 countries.